If you were to ask me to look back and pick one thing that made a difference in the success of my business, I would have to say meeting Nicole Dean. One of my business associates told me that I needed to follow Nicole Dean on Twitter because not only is she hilarious, that she’s brilliant. So I followed her and didn’t think much about it. 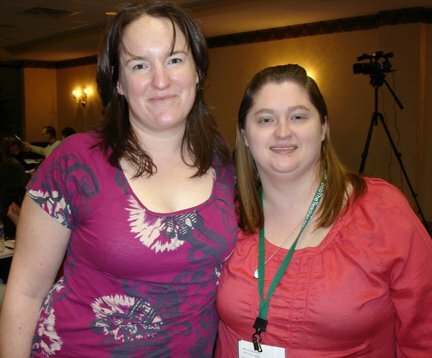 Several weeks later, she started doing a weight loss challenge on her blog and I participated. At that point, I got to know Nicole herself. But how has Nicole affected my business? I can’t say my business wasn’t going well before I met Nicole or wouldn’t have achieved the same success… eventually. I do think it was faster and smoother because of the knowledge I learned from Nicole. From her blog, info products, and even stopping to answer my questions in person, Nicole is friendly and approachable. On Nicole’s blog, she has this wonderful, brilliance that she basically gives away. But you know, if I had a thousand dollars in my pocket right now that I could use for anything, I’d go on Nicole’s websites and buy everything (else) she sells and everything she recommends. And then I’d go on to Lynn Terry’s blog and buy everything else that she recommends. Now, Nicole doesn’t know that I’m writing this blog post. But I am going to review two of my favorite products from Nicole. The first is her YummyPLR site. You may think it’s odd that I would endorse a PLR group considering we offer writing services. But I will tell you more about that on Monday. The second is her How to be a Rock Star on Your Own Blog World Tour. Guest blogging is not a new concept. But Nicole takes the tour to a new level where you do a week of posts, maybe two weeks, or a weekly post on someone else’s blog and it’s a great way to increase links back to your site. It’s a great way to get people on your site and excited about you. It’s a great way to create partnerships. I have not done my blog world tour yet. I intend to do it after Christmas. I’ve done several guest blog posts and I always get a ton of hits from it. It’s always fun to write for somebody that does something differently for you. Be sure to check back for my review of Nicole’s Blog World Tour e-book. My suggestion if you’re don’t already following Nicole on Twitter, start right now. If you don’t use Twitter, you can follow her on her blog, Nicole on the Net. The thing I love about Nicole, she’s never salesy. You don’t get on her blog and her stuff her products down your throat. One of my favorite blog posts every week is her Weird Niche Wednesday. There’s always something just hilarious, like inflatable foods and I have no idea where she finds her topics. If you want to know anything about affiliate marketing or internet marketing, her blog is my suggestion on where to start. Check out Nichole’s recent guest post on Guest Blogging on The Small Business Transcriptionist. Note: There may be affiliate links contained in this blog post. This is not a sponsored post and is my personal opinion that I chose to share. I personally use many of Nicole’s products. Wow, wow, wow, and wow! I’m absolutely weepy to read this. Thank you! By the way, you’re pretty darned impressive yourself and I’m very thankful to have met you, too!